This book mixes lively narrative with comic-book-style artwork-a tasteful blend that will make the pages come alive for young readers. Much like the author’s previous title, Olympia: Warrior Athletes of Ancient Greece, this book gives an engaging look at a fascinating piece of history. Blacklock has written a number of other history books for children, including Pankration: The Ultimate Game, an adventure novel set in Ancient Greece, and Nudes and Nikes: Champions and Legends of the First Olympics, a history of the Olympic Games. 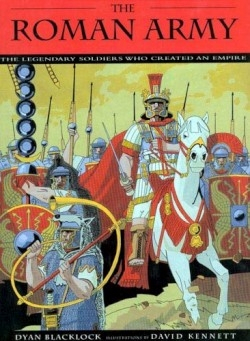 This book begins with an overview of the Roman Empire, and then quickly moves into the daily life of a Roman soldier. The author vividly describes the conditions that the soldiers faced, including where they lived and what they did with their families. The Roman Army endured, at times, the most brutal weather conditions; Blacklock devotes several pages to describing how they survived the snow and cold. Also, she explains how the soldiers traveled to battles-the boats they built to cross seas, and the tactics they used to cross mountains and rivers. Readers will learn details like how much the soldiers? gear weighed and how they made their weapons. The illustrator works well with the author; the action sequences show not only what the weapons looked like, but also how the weapons were used. The book also includes more than two dozen illustrations of what the Romans? enemies looked like and how their weapons were different. The depiction of war and fighting is what makes this book rise above others. Other books on the subject often focus exclusively on the lifestyle and times of the soldier, but Blacklock takes the time to describe in detail how the wars were fought, including information about the strategies that the army used to win war. The publisher recommends this book for ages six to ten; the scenes of war, however, make this book too intense for most readers in second grade and younger. What the book lacks is photographs. The book is obviously intended to tell a story through the illustrations, and it works; the illustrations are expressive and capture the emotions of the text. Photographs, however, would have made the story more lasting and real. Despite this minor shortcoming, The Roman Army is a great way to introduce children to these legendary warriors.